I knew he was knocking on but I was still surprised and saddened by the death of Pete Seeger on Monday, 27 January. 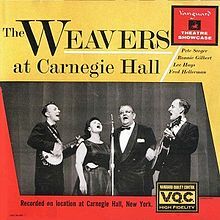 I grew up with Pete’s music, especially his recordings with the Weavers – The Weavers at Carnegie Hall had been a childhood favourite. My Facebook page filled with tributes and postings of his music and I posted plenty of my own. But it was a couple of days later when I remembered his haunting ballad, “Snow”. Pete was 94. Up to the end he was singing at Occupy Wall Street actions and environmental protests. You can read a full obituary here.